1. The load center distance is 500mm. 2. When these hydraulic internal combustion forklift trucks are loaded, their travel speed is 18km/h. When they are unloaded, their travel speed is 19km/h. 3. Their fork length is 1070mm. For more parameters about these hydraulic internal combustion forklift trucks, please refer to the parameter table. 1. Big arc design on top of the ballast improves the visibility of rear view and guarantees the optimum visibility when the truck is driven reversely within fixed distance. 2. The load center distance is 600mm. 3. 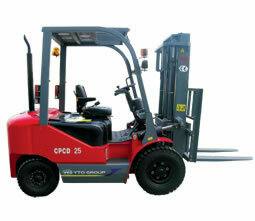 When these hydraulic internal combustion forklift trucks are loaded, their travel speed is 20km/h. When they are unloaded, their travel speed is 21km/h. 4. Their fork length is 1220m. As a professional Chinese hydraulic internal combustion forklift truck manufacturer, we can produce not only fork truck, but also bulldozer, crawler tractor, road roller, road grader, asphalt mixing plant, trash compacting machine, etc. Our products have obtained CE, E-mark and OECD certificates, so you can feel secure in using them. If you are looking for high quality, low priced construction machinery, agricultural machinery, and other vehicles, please contact us. We will not let you down.